With the couple recently selling Syntel to French technology services major Atos SE for $3.4 billion, their fortunes are going to see a sharp turnaround. Syntel co-founders, Bharat Desai and his wife Neerja Sethi, have seen their rankings dive on the Forbes Richie Rich lists in the past few years. Desai, who was ranked the richest Indian-American in the World Billionaires list in 2014, came in at No. 1999 in the 2018 rankings. Similarly, Sethi ranked 21st on the magazine's list of America's 60 self-made richest women, down from rank 14 in 2015. But with the couple recently selling Syntel to French technology services major Atos SE for $3.4 billion, their fortunes are going to see a sharp turnaround. According to The Times of India, they jointly held a 57 per cent stake in the company, which means that they will walk away with nearly $2 billion from the all-cash deal expected to close by the end of this year. That's a pretty impressive way to end a journey that Desai and Sethi embarked on 38 years ago, when they started Syntel from their apartment in Troy, Michigan. Kenya-born Desai, who grew up in India and graduated from IIT-Bombay, reportedly moved to the US in 1976 as a programmer for Tata Consulting Services. After working there briefly, he went on to pick up an MBA degree from the University of Michigan. It was here that he met Sethi and the duo decided to start an IT company while they were still studying. At an entrepreneur event in 2013 in Delhi, Desai reportedly said that "I always wanted to run a business of my own. I was a horrible employee and could not live by anybody else's rule. So, the best way was to start my own company. My wife is the toughest board member." He had further stated he knew the IT services industry would grow significantly and with the right moves, "we could outpace overall growth." The report adds that Syntel, modelled along the lines of TCS in some ways, was set up with an initial investment of just $2,000 in 1980. It went on to post revenues of $30,000 in its first year and got a massive boost when it signed on General Motors as a client. Though it started out as an IT staffing company, it soon evolved into a firm providing IT applications services. In 1992, it opened the first of its multiple India Global Development Centers, and five years on the company not only went public but also managed to grow its turnover to the $100 million milestone. It is currently nine times bigger - Syntel raked in nearly $924 million in 2017. In April, after releasing its first quarter results, the 23,000-employee company had said that it expects revenue of $920-960 million in 2018, based on an exchange rate assumption of Rs 65 to the dollar. But if the dollar continues to remain as strong as it is currently, the figures will likely move up. Yet, despite all this, Syntel failed to soar to heights of tech giants. Consider Infosys for instance. Though it started just a year after Syntel, today it is India's second largest IT services firm with over $10 billion in revenue, 10 times that of Syntel. 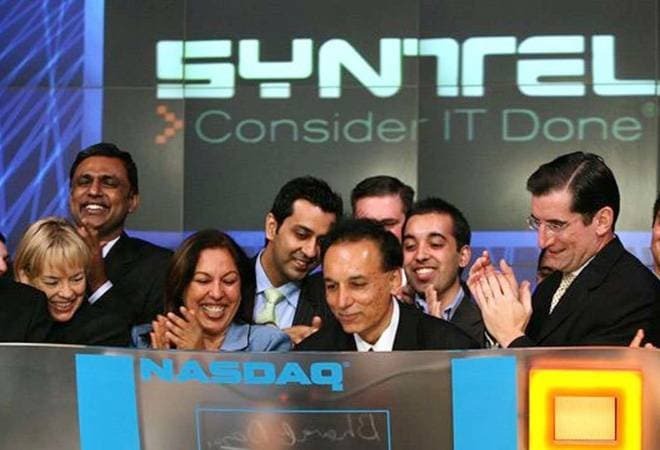 Desai and Sethi had a dream run in the years leading up to the dotcom bust - including bagging the 2nd spot in Forbes' "200 Best Small Companies in America" rankings - but then Syntel's share price plunged in 2000-2001. The company recovered and its share price rallied an impressive 1766 per cent on the NASDAQ between 2001 and 2015, before running into rough weather again. In 2016, the stock plunged from $46 to about $19 per share in just over two months after the company declared a special cash dividend of $15 per share in September 2016. "The special cash dividend will be funded through dividends to the Company by U.S. subsidiaries, the one-time repatriation of approximately $1.24 billion of cash held by the Company's foreign subsidiaries and a portion of borrowings under a new senior credit facility," the company had said at the time, adding, "In connection with the one-time repatriation, the Company expects to recognize a one-time tax expense of about $264 million (net of foreign tax credits) in the third quarter of 2016." In the bargain, the company also had to downgrade its earnings per share outlook to a loss, which prompted a massive selloff of the stock, from which it is yet to fully recover. Nonetheless, the share prices have jumped nearly 110 per cent in the past year, which partly explains the price now paid by Atos.